The Northeast US was well represented by leaders in both the government and industry perspectives. 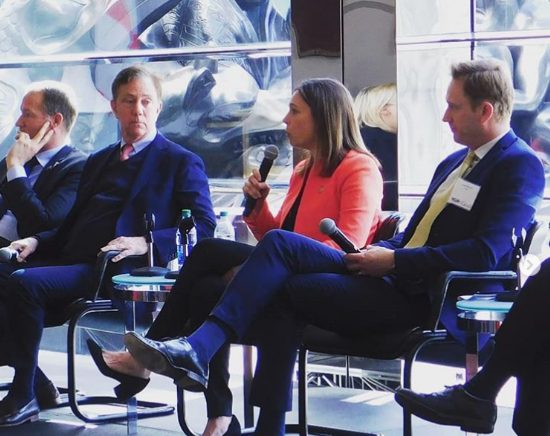 Connecticut Governor Ned Lamont headlined a roundtable discussion on the offshore wind market. Governor Lamont emphasized the regional nature of offshore wind, both as an energy source and an economic development driver. “I’d like to see a regional roadmap for offshore wind in the Northeast, and encourage entrepreneurs and developers to come forward,” Governor Lamont commented. Joining Governor Lamont on the panel was Alicia Barton, President and CEO of the New York State Research & Development Authority (NYSERDA). Ms. Barton highlighted Governor Cuomo’s topline clean energy goals (100% clean electricity by 2040) and the critical role that offshore wind must play to achieve it. 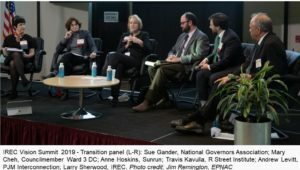 “States are collaborating together on offshore wind; that means lower costs, less risk, good news for the entire Northeast,” Ms. Barton said. Morten Baek, Permanent Secretary for the Danish Ministry of Energy; Thomas Brostom, CEO of Orsted US Offshore Wind; and Walter Cruickshank, Acting Director for the Bureau of Ocean Management at the US Department of Interior; rounded out the panel. 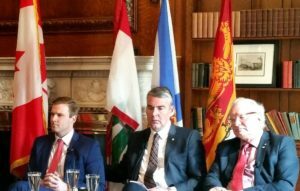 All agreed that offshore wind policy, when designed appropriately, can address energy security, climate change, and economic development challenges.